Obsessive Loom Acquisition Disorder. OLAD. I knew about the malady, but never expected to be infected so quickly. Looms have very specific functions, designed for specific styles of weaving, sort of like the way sewing needles are designed for specific tasks, only taking up way, way more floor space. And I've got it bad. My OLAD was still manageable when I had just the Baby Wolf and the Mirrix, each designed for specific purposes. This sweetie is a terrific loom, but it has its limitations. It's considered a portable loom, so it's not quite sturdy enough for weaving rugs. (With all this fabric around me, I see many, many rag rugs in my future.) And, it only has four shafts (patterns are made by threading the warp through different shafts), the more shafts a loom has, the more complex the patterns can be. I have woven several things on this loom, not the least of which is the beautiful overshot pattern to the left. With careful threading of the shafts and repeated sequences of treadling, marvelous designs can appear. It was the "mathyness" that drew me to quilting originally, taking just simple bits of algebra to cipher out an entire quilt. Weaving is also mathy, and I love it! 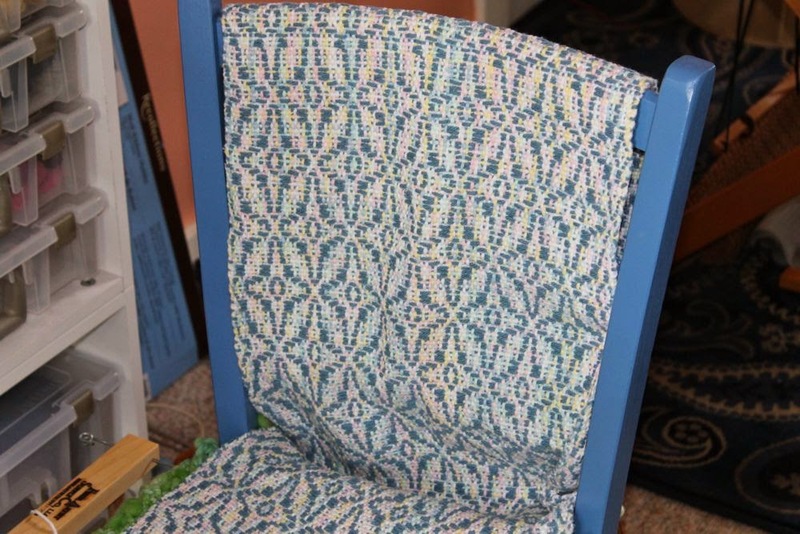 But just as, after a time, all those straight lines in quilting designs began to chafe, so it is with weaving. 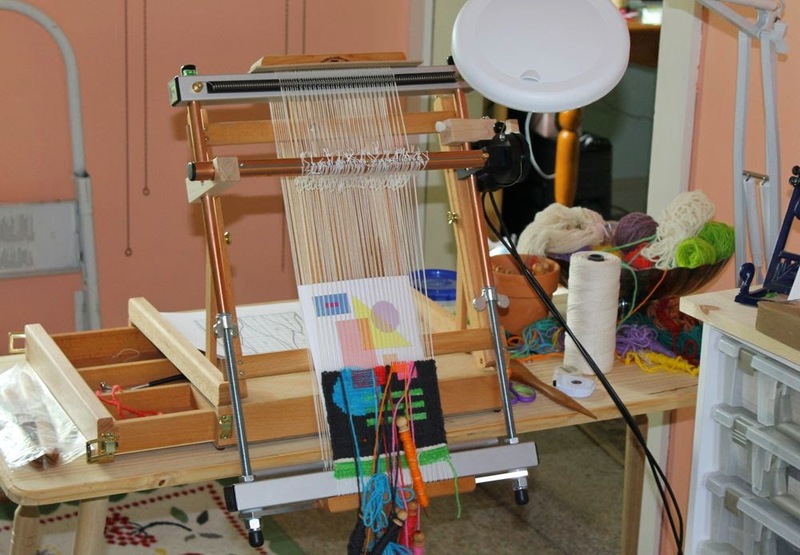 So, I needed a tapestry loom.Tapestry weaving lets me draw with yarn. It's the weaving world's equivalent of applique. 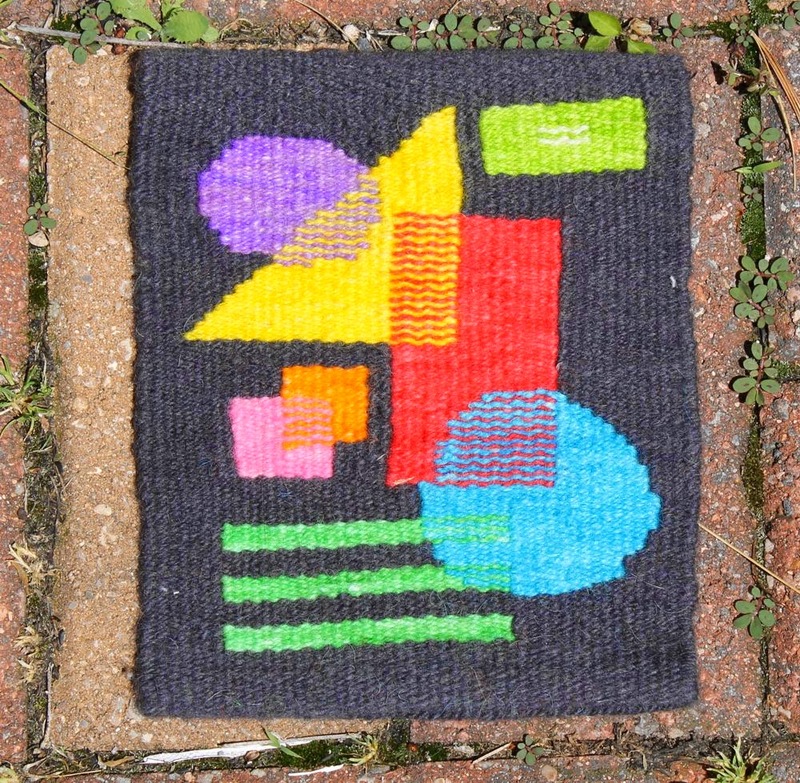 I am taking an online class from Rebecca Mezoff, and so far we are only up to geometric forms. 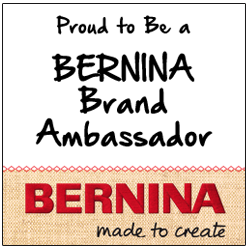 The class has been just marvelous, Rebecca is a terrific teacher. This is my final project for Part One. Curves aren't actually covered until Part Three, which is next month, but I couldn't help myself. They were supposed to be circles, those blobs, but at least the top one ended up a convincing oval. Even the triangle was a bit of stepping out, we're only just now getting the the lessons in triangles, in Part Two. 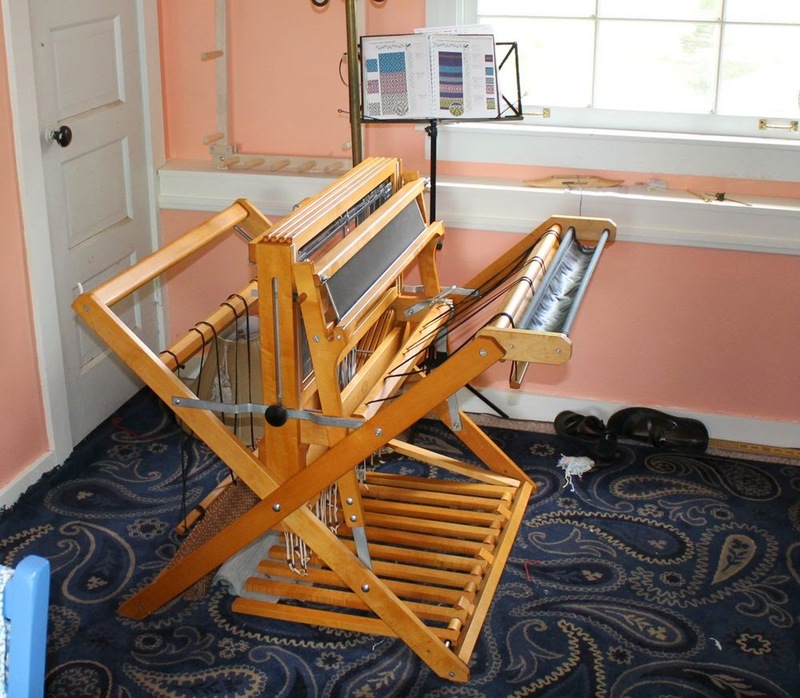 And now to the OLAD, one more type of loom, this one a for-real floor loom, a heavy duty loom that can handle rug making, and also with more shafts for more intricate patterns. I've been watching for a used loom to come up for sale nearby, and one did, just last week. Introducing the Norwood. 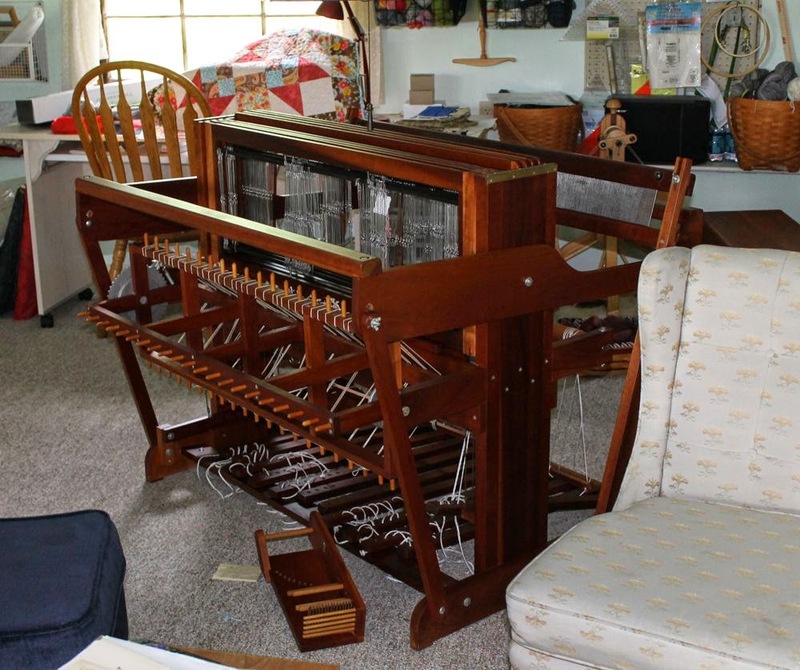 These looms have a delightful Michigan history, built by a furniture maker out of cherry wood. She has eight shafts, and a weaving width of almost forty inches. She also has a sectional warp beam (it's the spiny looking thing on the left), so I'll need to learn how to work with that. I wish I could say that I was done buying looms, but I fear I have a couple more in my future. I'm certain that I will eventually want a larger tapestry loom, and I'm also considering a band loom, to weave intricate, skinny bands of color. But that's it, really, who actually needs a loom with more than eight shafts, or hooks up to a computer, or is just bigger? Nah, I'm done with OLAD, really I am.